MANILA - The Chamber of Mines of the Philippines has backed the decision of the Mines and Geosciences Bureau to suspend the operations of a nickel miner in Surigao del Norte for causing excessive siltation along the shoreline of Claver town. The group said in a statement Shenzou Mining Group Corp. was one of foreign mining companies on the watch list of the mining bureau for alleged violations of environmental laws. Shenzou is not a member of the chamber. 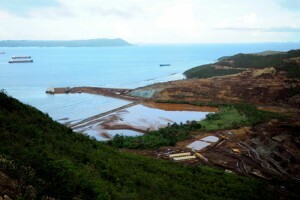 The bureau last week suspended the nickel operations of Shenzou for causing extensive siltation in the coastal areas of Claver. A government team said the company did not adequately address siltation incidents in the area after building a “settling pond” right on the sea. The pond is a structure where silt-laden water is impounded temporarily until the silt materials settle down and before water is allowed to overflow. The chamber assured that its members practise responsible mining and comply with the environment standards. The group said it was closely monitoring members and reminded those found to be reneging on their duties to the environment and host communities to apply corrective measures. Such a violation is enough ground for suspension or expulsion from the membership roster. “We believe that as an active player in an industry that is subject to meticulous scrutiny by government and civil society organizations, COMP should take a lead role in addressing expectations for sustainable development,” said Chamber of Mines chairman Art Disini. The group is urging members to put considerable thought into a range of social issues—from land use, water use, and environmental performance to worker safety and respect for human rights.